On May 2nd, 2017 we met the community of Thung Yor, Klong Thom District, Krabi province to introduce mangrove restoration project using the CBEMR process in a 3 pond site located near the village. Synchronicity Earth of the UK is funding this new mangrove restoration project which is MAP’s largest to-date, and the first multi-pond site. In addition to the community members, MAP invited three experienced CBEMR community representatives from other sites to share their first-hand experience on mangrove restoration. Other stakeholders such as the Department of Marine and Coastal Resources (DMCR) and MAP’s fisheries advisor were invited to share their mangrove restoration experience and encourage the community. Arriving at Thung Yor, there aren’t many mangroves to see as the village is surrounded mostly by oil palm and rubber plantation from which 90 % of the villagers earn their living from. We didn’t see a typical village either as houses are spread amongst the plantations. Despite this Thung Yor’s 450 population utilize the mangrove for supplementary food supply and are indeed protected from storms by the mangrove buffer so they understand its value. 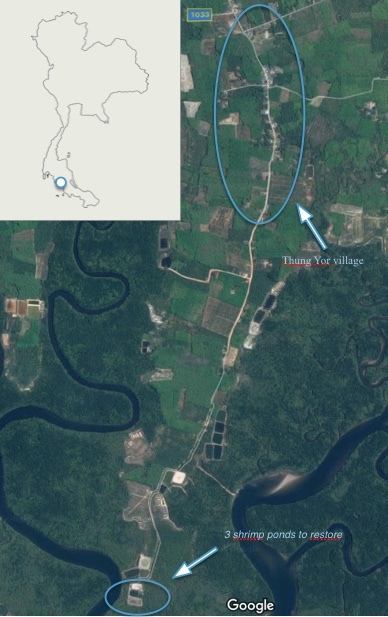 Just a couple months ago, MAP had learned from the DMCR of three illegal abandoned shrimp ponds which had been taken back by the government and got in contact with the village chief, Mr. Raksa Kohmodkan. He was aware of the situation and showed a great deal of interest to have this site restored back to a healthy mangrove ecosystem. To start this first community meeting, Ning, MAP Project Manager introduced the CBEMR process. Then the three community CBEMR experts who were already partnering on mangrove restoration projects with MAP shared their experience, not only in the same local southern dialect but also terminology which was easily understood. The critical role of mangroves in reducing the risk of disaster for coastal communities and slowing erosion was explained. 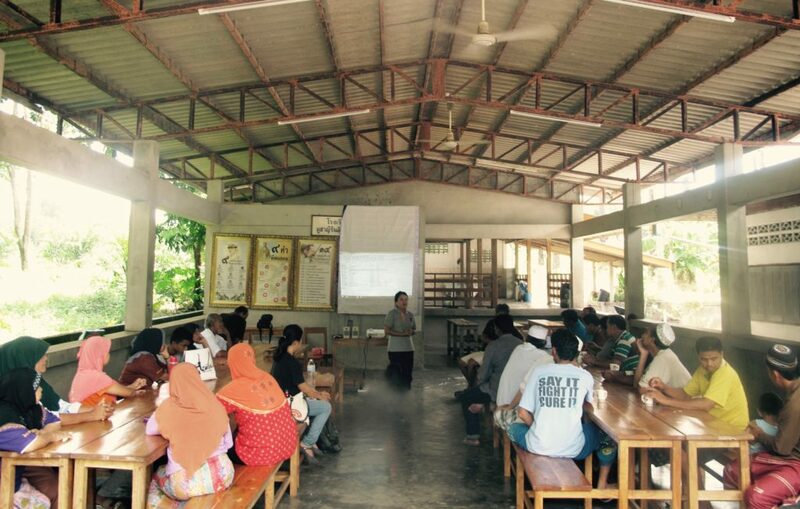 These experienced local practitioners also revealed how their own CBEMR project unfolded along with positive outputs, such as community awareness building, environmental education for school children and supplementary incomes gained from mangrove honey production. A government officer, Mr. Pisit Thongkong, from the Mangrove Development Unit of DMCR emphasize the importance of working together and that the project needs to be integrated with government, the village, and MAP. More than 30 villagers attending the meeting became eager to join the CBEMR network and carry out their project. The next steps will be to sign an agreement between the DMCR, the village chief, the chief of the district and MAP to officially start the work in the field work by restoring the natural tidal hydrology to the three ponds. MAP starts every restoration project through a multi-stakeholder process and it very interesting to realize all the homework which must be done before starting the restoration in the field to prevent problems later. It’s crucial to build awareness about the benefits of mangroves and to explain the project clearly. Another important issue is to be certain about site’s land tenure and how should the site be used in the future. Every potential restoration site must be evaluated on technical, economic and social bases. If there is not strong community interest and support, MAP will not start, as the long-term protection of the site will largely depend on the local community.